Like many, it all started at home but what a unique home it was. Nathan’s first experience picking up the guitar was an attempt to copy the challenging riffs his brother David created after studying with celebrated virtuosos Don Ross and Preston Reed. His sister Beth demanded perfection in all vocals as any self-exacting classical voice teacher would, while his mother initiated him into the business side of the music industry. His father and uncle informed both his writing style and an ethos of Canadian people that shines in his lyrics. While others were hiding their braces behind their hands, Nathan was already up high on stages of all sorts. In winter, he traveled with and won solo vocal awards as part of the Appleby Boys Choir. Summers were saved for his first love – appearances at folk festivals and the opportunity to meet, perform with and learn from outstanding musicians. 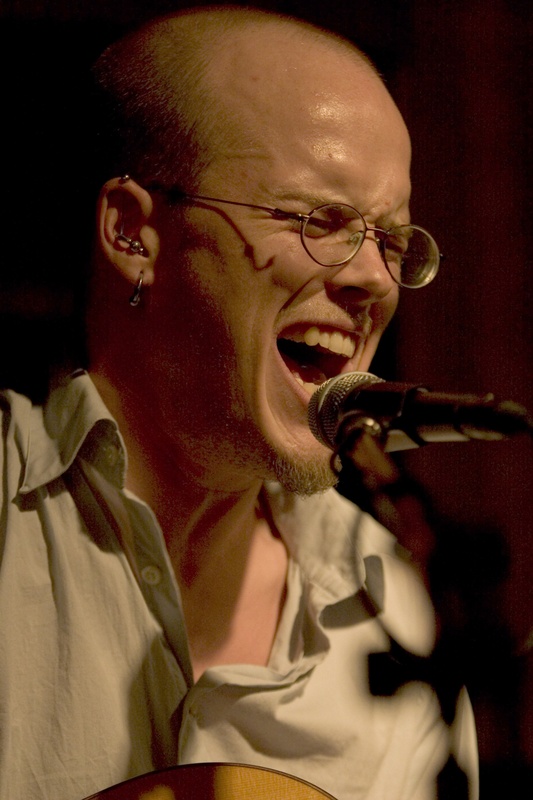 Before he even had an album in hand, Nathan’s reputed vocal ability had him singing on stage with such notables as JP Cormier, The Oysterband, Spirit of the West, John Cameron, Connie Caldor and James Keelaghan. With a degree in comparative religion, an award winning voice and two prized Laskin guitars under his belt, Nathan founded his own record label, Halfway Cove Music. In 2005 he finally released his debut album, True Stories. Produced by Rick Fenton (former AD of Winnipeg Folk Festival), distributed by Festival and studded with such outstanding roots musicians as Nikki Mehta, JP Cormier, and Murray Pulver, True Stories was met with critical acclaim both at home and abroad. If multiple encores at every show are any indication, Canadian audiences coast-to-coast seem to like it too. Nathan’s performance style leaves the audiences wondering where the rest of the band is hiding. Singing, chanting, playing the guitar and stomping, he fills any stage with “magnificent powerfully clear lyrics and arrangements.” Described as ‘intelligent and witty’, Nathan will ‘move men and women to tears with his sound and conviction.” Nathan continues to earn his place in the Canadian folk and blues canon and has recently become an adept throat singer, specializing in the Tuvan and Mongolian styles. A cultural tour-de-force in his own right, Nathan now brings a uniquely eastern flavour to a western tradition.